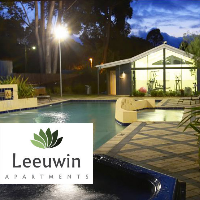 Situated in the world famous wine region of Margaret River, Forte Leeuwin Apartments are only a five minute stroll to the local township, which boasts renowned restaurants, bars and extensive galleries, and perfectly located for you to investigate the vast variety of wineries this region has to offer. This apartment comfortably sleeps up to four guests with a queen-size bed in master bedroom and either a queen or two singles in the second bedroom. There are two full bathrooms and each are fully self-contained with spacious living and dining areas. This room type consists of a queen-size bed in master bedroom or two single beds. Each apartment has a full bathroom and has extremely spacious living and dining areas. All apartments are fully self-contained consisting of a full kitchen, DVD, CD and a washing machine. This two level apartment has a bedding configuration of queen bed in master, queen bed in the second bedroom and two single beds in third bedroom. The entire ground level consists of a full kitchen, laundry, a large living and dining area and a powder room.